The rise of Johnny Cash can be considered a template for the career of a successful Country and Western artist, but it is little appreciated how much of Cash's success can be traced to Old Time Radio. Although his rise to fame occurred when many stations were transitioning from the dramas and artist-centered programs to a more inexpensive disk jockey format, his managers and record label took advantage of a radio presence beyond record play. Johnny Cash was born into a family of sharecroppers in Kingsland, Arkansas, 1932. He joined his family working in the cotton fields at the age of five and the deprivations of growing up during the Great Depression helped to shape his music. Cash learned to love gospel songs and to play the guitar from his mother. His deeply held religious beliefs were strengthened after he lost a close older brother to a sawmill accident in 1944. Although a deep bass-baritone would become an important part of Cash's sound, he was also deeply influenced by hearing Irish tenor Dennis Day each week on The Jack Benny Program. After graduating from high school, Cash traveled to Detroit, Michigan, and worked for a short time in an automotive plant. He soon left the plant to join the United States Air Force in 1950. After his basic training in Texas, he met 17-year-old Vivian Liberto. 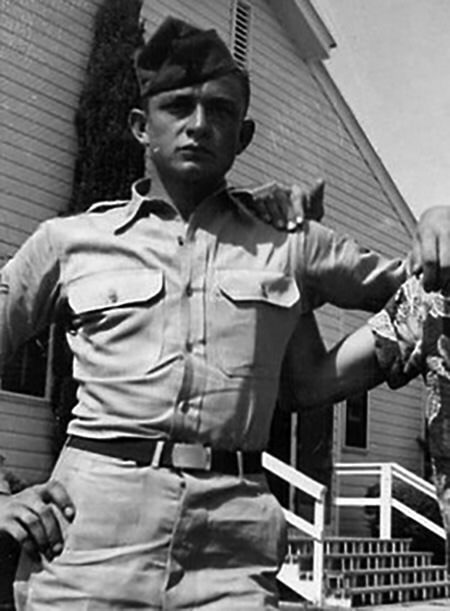 While serving in Germany, Cash formed his first band with squadron mates and exchanged hundreds of letters with Liberto. The couple were married after his discharge in 1954 and soon moved to Nashville, Tennessee. In Nashville, Cash was introduced to a pair of auto mechanics who played guitar and bass fiddle as "The Tennessee Two". Cash was selling appliances and studying radio broadcasting when he became the front man of the "Tennessee Three". After screwing up his courage, Cash approached Sam Phillips of Sun Records, hoping to cut a series of gospel records. Sun had seen little profit from the gospel market, and it is rumored that Phillips told Cash to 'go home and sin for a while, come back when you have a song I can use' (Cash denied the incident). 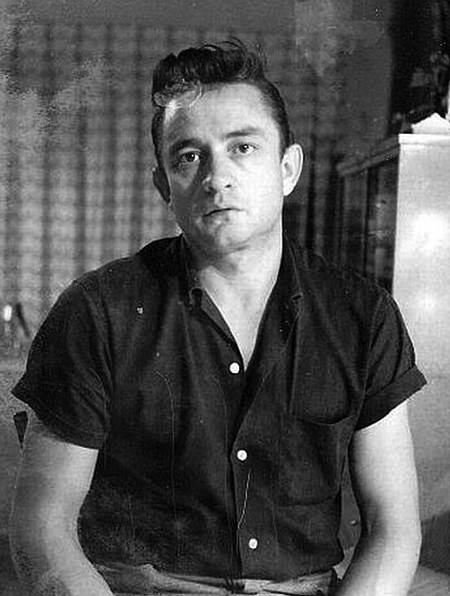 Cash auditioned again with a more rockabilly sound, featuring what would be his earliest hits, "Hey Porter" and "Cry! Cry! Cry!" About that time, Cash and the Tennessee Two were hired by the Home Equipment Company to sing and pitch appliances over a local radio station on The Johnny Cash Show. Later, Carl Perkins was cutting some tracks on December 4, 1956, with Jerry Lee Lewis playing the piano. Johnny Cash was at the studio visiting Phillips when Elvis Presley stopped by. An impromptu jam session began and Phillips left the tapes rolling. Johnny Cash had several hits with Sun Records, including "Folsom Prison Blues" and "I Walk the Line" (his first Number 1 hit) when the Army Recruiting service approached him to appear on Country Style USA. Some time after leaving Sun for Columbia Records, the Treasury Department had Cash pitch Payroll Savings Bonds on Guest Star. He made the move to Columbia seeking more artistic control, his early recordings with the new label were cowboy songs, some featured on Guest Star, and he was allowed to follow up with an album of gospel tunes. Be the first to comment on "Johnny Cash"